Change your fuel, save the world. Blue Flame™ is a biomass gasification system which can be used in stand-alone ‘greenfield’ projects or supplement to ‘brownfield’ projects to improve efficiency, performance, environmental conformance, and economics. Blue Flame™ is commercially proven and very efficient, even on small scales. Gasification is thermal conversion of carbonaceous feedstock by partial oxidation into a clean product gas that is used as fuel. The fuel is often referred to as Producer Gas or Synthesis Gas (Syngas) which is a combustible gas mix of hydrogen (H2), carbon monoxide (CO), methane (CH4) with inert gases such as nitrogen (N2), carbon dioxide (CO2), water vapour (H2O) and traces of tar and other particulates. Typically, the oxidizing element used is air and/or steam. The thermal conversion consists of four stages, namely, drying, pyrolysis, combustion, and reduction, where R+ uses a downdraft gasifier as illustrated in the figure below. The Producer Gas (or Green Combustible Gas in figure above) can be used in kilns, incinerators, boilers, gas engines or gas turbines for electrical or thermal application. However, due to the high temperature and the traces of contaminants of Producer Gas, it may require cleaning and/or cooling but is dependent on the usage. Our Blue Flame™ biomass gasification system consists of feedstock conditioning, gasification, and Producer Gas conditioning as seen below. With our expertise, we are able to condition various types of biomass feedstock to accommodate the gasifiers. After gasification, the Producer Gas will then be conditioned to meet the requirements of our clients, be it for electrical or thermal applications. 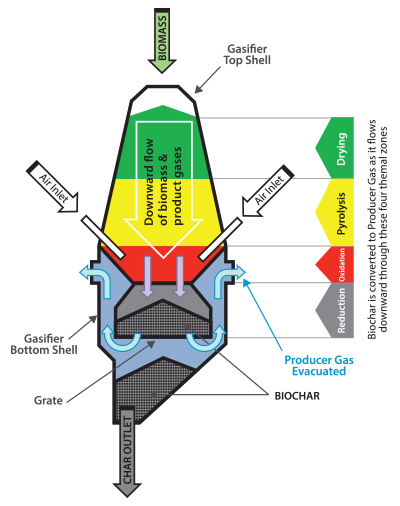 The co-product of the gasification process is Biochar, which is highly valuable due to the diversity in its application. Biochar is a charcoal-like substance which is made from biomass via pyrolysis under controlled conditions with clean technology. Although biochar is considered a by-product of our gasification system, it can be used as an additional source of revenue to any project. Alternatively, Biochar can be placed back into the ground, effectively removing carbon from the atmosphere while simultaneously nourishing the soil. Biochar improves soil condition and overall reduces greenhouse gases. It helps to prevent fertilizer runoff and leeching, enabling less use of fertilizer and diminishing agricultural pollution to the surrounding environment. It also retains moisture, helping plants through periods of drought sustainably. Most importantly, it replenishes exhausted or marginal soils with organic carbon and fosters the growth of soil microbes essential for nutrient absorption. Just like how charcoal tablets are used to help with digestion of food, Biochar provides the same capabilities. It can be used for detoxification and act as a carrier to active pharmaceutical ingredients. Since Biochar is similar to the likes of charcoal, it can also be used to generate power. 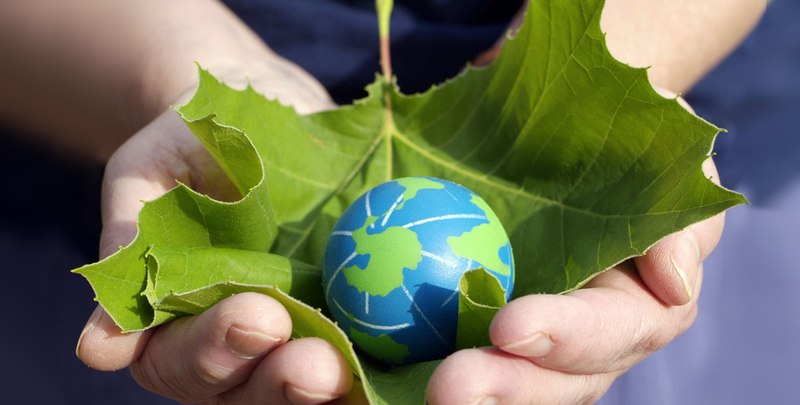 Due to the fact that Biochar is made of biomass from the environment itself, it creates an active cycle creating power to produce more power with less raw biomass. The Biochar produced from our systems can also be gasified using our gasifiers. Due to the biochar’s absorbent capabilities, it not only absorbs water and moisture, but can also absorb odour. Biochar can absorb water up to 6 times its weight which makes it ideal for insulation and dehumidification. These are just a few of the many uses of biochar and more can be found online. www.biochar-journal.org is an excellent resource for more information on Biochar research and news.